This jumper was an Urban Outfitters bargain basement steal - only $10, and I liked it so much at the time I actually bought it in white as well. Now they both haven't been worn in quite some time because I can never think of what to put under them. I know, it shouldn't be that hard, so to get some inspiration and to participate in Eyeliah's style challenge this week, I searched the wardrobe_remix photo pool until I found AnaBita's adorable jumper look. Mama's got a brand new bag ;P, originally uploaded by AnaBita. I was originally going to put on my grey diamond print tights, but the though of an outfit completely devoid of color was bothering me, so chose the berry paisley tights instead. 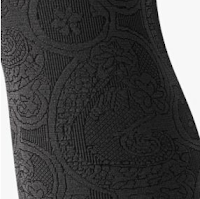 The paisley print is subtle, I should have taken a better picture of it - but here is a close up of them in black from Khol's website, where they are on sale for $5. It's crazy they even still have them, since I purchased them well over a year ago! I love your outfit - the sheer blouse is devine! I would love to participate in Style Symmetry competition as well but I haven't my wardrobe remixer yet! You were right to go for the red tights, they brighten the outfit! This outfit is so cute! I love the inspiration and your interpretation. that's a lovely jumper you got there. I've been trying to wear things I haven't worn in forever too. I love the GAP blouse. This is great! Jumpers sometimes look too sweet and girlish, but your shoes definitely make it look more grown up. That blouse is so adorable. The whole look just WORKS!